A ‘syringe pen’ was handed out to a 9 year old boy in Wellington recently as a prize at a local swimming pool. Needless to say, his parents weren’t happy. 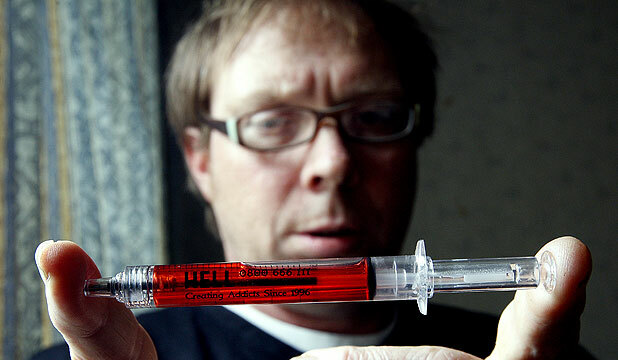 The pen itself appears to be full of blood and says on the side: “Hell, creating addicts since 1996”. Hell Pizza is, perhaps unsurprisingly, a pizza firm, based in New Zealand. They have a habit of creating PR storms, and this incident, which is the result of a sponsorship tie-in with the local council is another example. For instance, in 2006, Hell posted condoms out to promote its Lust meat pizza, attracting 685 complaints. 2011: A billboard featuring a bun decorated with the words: “For a limited time. A bit like Jesus” attracts 179 complaints to the Advertising Standards Authority. 2009: A Hell billboard carries the phrase “At least our brownie won’t eat your pet dog” – a reference to Tongan Paea Taufa roasting a pit bull terrier-cross in an umu at his Mangere home. 2008: Hell began a “$25 Hot as Hell” direct mail ad, which promised a Thai massage with a pizza, if the offer was redeemed in Thailand on the day of purchase.